I really like their band name. I'm unsure about its origins; it seems like they found two random words from the dictionary and thought it sounded cool. Well, they were right! But I'm not here to talk about their 100 percent awesome band name; I'm here to discuss their 100 percent awesome music. And ... yeah. It's great. Most of all, I especially like their sound. They're like a lighter version of Dire Straits with an extreme fondness for bossa nova. They specialize in creating strictly accessible music, and they have quite a knack for it. They almost couldn't get a more appropriate album opener than their big hit "Oblivious." It's energetic and instantly memorable, and it utilizes their Brazilian connection with their college-rock mentality to deliver something quite palatable. It's hardly a perfect song; while catchy it does tend to overstay its welcome and the ending is mightily awkward. 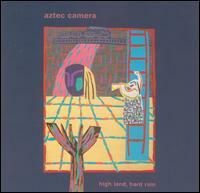 Aztec Camera do seem to have a difficult time knowing how to write good endings... But who cares when it's so much fun and it makes me want to bounce happily in my seat! While that song is undoubtedly great, the highlight of the album is certainly "We Could Send Letters," an utterly beautiful and oddly uplifting experience. It goes on for nearly six minutes, and it's to the point where I'm not ready for it to end. Vying for the position as the most unique song of the album is without a doubt "Lost Outside the Tunnel," which features a rather unique chord progression, still energetic instrumentals and even a distinctive texture and atmosphere. They go for straight bossa nova with "Release," and it's as charming as ever. Even when they strip back the other instrumentals and try straight, bouncy folk music with "Down the Dip," they manage to come out likable. Just to keep things relatively unpredictable, they end the album with the country-western "Queen's Tattoos." These guys keep the album sounding diverse, relatively speaking, while rarely altering from their pleasant and lighthearted mood. Furthermore the fact that most of these songs are generally well-written makes this just a very good album! Just to make sure I didn't build these guys up too much, I don't think High Land, Hard Rain is a genius piece of work; it has plenty of flaws. As I hinted, they do have a hard time coming up with truly durable melodies. It seems like, for example, "Walk Out to Winter" ought to have been much more hooky. The transition to the chorus in "Haywire," while possibly appropriate for the songs' subject matter, still makes me uneasy. Their idea to fade the ending of "Back on Board" with the beginning of "Down the Dip" couldn't have been more misguided. They're also not an extremely creative band. Sure, I like their pleasant music, but the only track that seemed to be striving for real, true-blue creativity was "Lost Outside the Tunnel." Surely, this album is well above average and extremely recommendable. I only wish every album I reviewed was as much fun. Nonetheless, it could have used some more polish, editing and a jolt or two of innovation... But I love it anyway!! 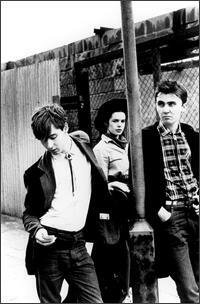 Long live Aztec Camera!!! !